This group includes the rodents, rabbits and hares. As herbivores, they primarily eat plants, although some will supplement their diet with insects and dead or decaying flesh. They rely on their diet to satisfy both their food and water needs. Some small herbivores found in the desert are the antelope ground squirrel, kangaroo rat, pack rat, blacktail jack rabbit and desert cottontail. 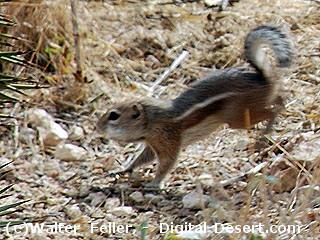 Although most mammals in this group are nocturnal, the antelope ground squirrel is undaunted by the desert sun. This rodent is often seen from the scenic loop drive during the hottest parts of the day, with its white tail held close over its back as it runs about. To cool off, it may go below ground but usually flattens its body against the soil in a shaded area and loses heat through conduction. Although it can drop its body temperature by as much as seven degrees in this manner, it can lose 13 percent of its body moisture per day. To make up for this water loss, it feeds on green leaves and drinks early morning dew. The kangaroo rat, named for its habit of hopping rather than running, does not drink, use dew or eat succulent foods. Its only source of moisture comes from metabolic water, water produced through the digestion of food. However, digestion creates very little water, so the kangaroo rat must conserve every drop. Its nasal passages are much cooler than its internal body temperature. Air which passes through these nasal passages cools and water condenses on the mucous membranes, where it is absorbed. The kidneys of the kangaroo rat are also very efficient, producing a urine four to five times as concentrated as human's. Additionally, the kangaroo rat has adapted behavior to survive in the desert. It spends the hot days underground where the temperature is 30 °F (17 °C) cooler and the humidity is much higher. Seeds are stored in the burrow where they absorb additional moisture before being eaten. Unlike rodents, rabbits and hares have two pair of upper incisors, one right behind the other. Thus, they are not classified as rodents, but as Lagamorpha, literally "animals of rabbit-like form." Rabbits differ from hare in that their young are born naked and blind, while young hares are born furred and sighted. The blacktail jack rabbit, contrary to its name, is a hare. To escape the heat it sits in "forms" during the day. Forms are shallow depressions near the base of plants where soil and air temperatures are cooler. Its enormous ears also provide a surface over which heat loss can occur. The desert cottontail, a true rabbit, prefers brushier areas than the jack rabbit, such as rocky canyons, floors of dry washes and river beds; mesquite and catclaw thickets are preferred. Unlike jack rabbits, it retreats into burrows to escape heat and danger. Both cottontails and jack rabbits are very prolific. However, their numbers are kept low by predation and disease. 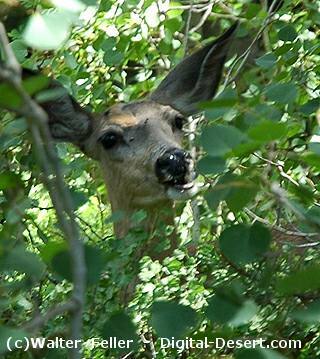 Mule deer, desert bighorn sheep and burros can also be found within the conservation area. Large herbivores derive some moisture from their plant food but unlike the small herbivores, also need drinking water periodically. The mule deer prefers foothills with low scrub growth or thick growth along washes. By late evening it leaves its daytime hiding place to find water in seeps and springs. 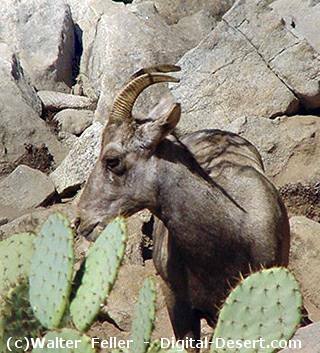 The desert bighorn sheep prefers steep, rocky terrain which provides escape from enemies and shelter from the weather. There are more than 13,000 acres of such habitat in the conservation area. The bighorn survives in the desert by traveling to water. It will not live more than two miles from a permanent water source. It may expand its range after rains fill more potholes, or tinajas, but such expansions are only temporary. The horns of the bighorn are formed by a bony structure at the base of the skull and are made of material called keratin. It takes about ten years for a ram horn to reach full size and they are often worn by butting and rubbing. Watch for these magnificent mammals on rocky cliffs. The burros compete with the bighorn for valuable water. 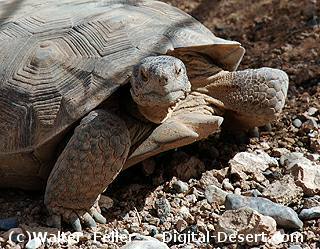 This animal, imported by the Spanish from the Old World, can survive well in the hottest deserts. It can lose 30 percent of its body moisture, then drink enough to restore it in a few minutes. One burro was found to drink five gallons in 2 1/2 minutes! Unfortunately, it crops shrubs and grasses to the roots and damages the underbrush. This destroys the food and habitat for numerous other animals.